This upholstery is for the standard cab front bench seat. 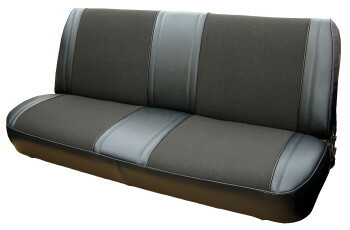 This upholstery is available in a single color vinyl or vinyl with Encore velour inserts. Upholstery comes with 1/2" of foam on the underside. All upholstery seat sets are the perfect replacement because they are not just covers – they are actual replacements for the existing covers. Just slip the old ones off and slip these brand new ones on. All sets come with complete instructions and we even furnish the hog rings and pliers to do the job. These are the perfect replacement covers that will make your vehicle feel and look “New” and “Fresh” again.